About 13 miles to the northeast of Shefｆield, 26 miles to the southeast of Leeds, there is a hill looking down the River Don. On the hill, there are ruins of Conisbrough Castle. The keep of it is said to be the finest and most beautiful in Englansd with its unique desigh. This castle was built as a mott-and-bailey castle at first about the end of 11th century by William de Warene, the Norman, and was rebuilt with stone in the 1180s by Hamelin Plantagenet, a half brother of Henry II. 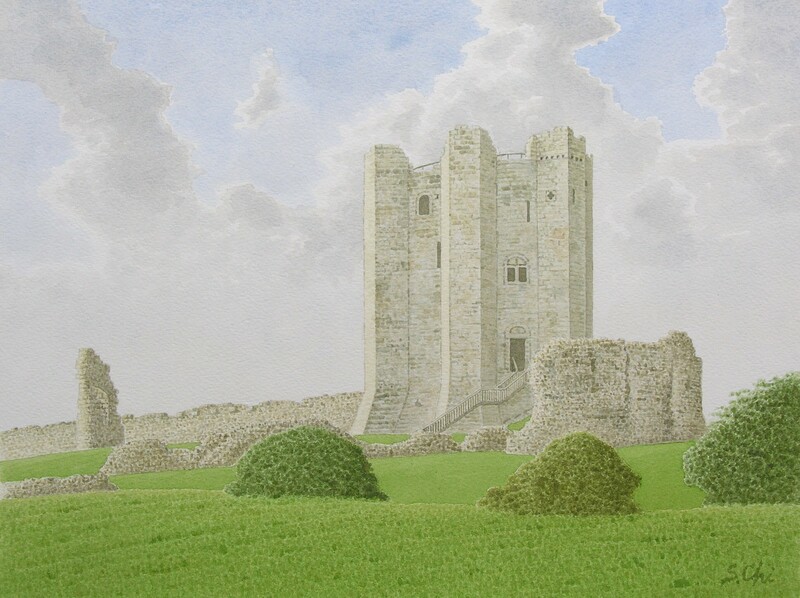 Many castles have a keep like a rectangular tower, but the keep of Conisbrough Castle hasd the shape of a round tower supported by six large buttresses. It looks like a long cog. The stout cylindrical keep is 90-99 feet high (the height of the keep differs in various sources) and its diameter is 52 feet and the thickness of the wall is 15 feet. It is beautiful and fantastic architecture! If I had seen only the keep, without looking at the ruined walls and the gatehouse, I might have taken it as somthing different, like a monument. I can understand well that Sir Walter Scott used the keep for a scene in his novel "Ivanhoe". It is said that there were two tiers of battlements on the top of the keep. I can imagine the figure of the keep must be very marvelous as if it had been wearing a crown. Conisbroufgh Castle was already in disrepair by the times of Elizabeth I and not used by the Royalists during the Civil War. It is the irony of the history that this castle survived contrary to the many other castles, which were held by the Royalists, were fired and destroyed by the Cromwellians.